After a stroke, only about 10 percent of people recover almost completely without intervention. For everyone else, therapy is a crucial part of the recovery process. Whether you need physical, occupational and/or speech therapy following a stroke depends on your needs, but the goal is the same: to help you regain control of your body and be independent once again. The therapy you receive should be tailor-made to suit your lifestyle. “Is the goal returning to driving or returning to work, or (is the person) a retiree who needs to take care of their own bodily functions and participate in playing with a grandchild?” says Glen Gillen, professor and director of programs in occupational therapy at Columbia University in New York and a fellow of the American Occupational Therapy Association. Most stroke patients stay in the hospital for five to six days. Their therapy needs are assessed within the first two days, and therapy may begin on the second. Some patients are sent home from the hospital right away. They may receive outpatient therapy sessions three times a week or get therapy at home from visiting nurses or therapists. Many stroke patients are discharged from the hospital to inpatient rehabilitation facilities, where they receive therapy at an intensity that’s best for their needs, based on the severity of the disability. Some go to acute inpatient rehab facilities, which offer the most intense therapy for the most responsive patients. Those with a greater degree of impairment may be sent to “subacute rehab” facilities, where the therapy isn’t as intense as acute rehab. Stroke patients often need physical therapy to strengthen their muscles, retrain their sense of balance and coordination and relearn certain movements. They may need occupational therapy to ensure they can do the tasks associated with daily living, like getting dressed, feeding themselves, showering or relearning skills necessary to return to work. Speech therapy also might be required to relearn how to speak or swallow food. Occupational and speech therapists also address cognitive challenges. Health insurance may limit how much therapy a person can receive during a single calendar year or during his or her lifetime. If a person can afford to pay out of pocket, he or she may continue therapy without interruption. Otherwise, many therapists offer plans that patients can follow at home or at a fitness center either on their own or with the help of a family member, friend or personal trainer. “You can keep working on the stroke problems indefinitely,” Dromerick says. Therapists hope to get stroke patients functioning independently again, even after their sessions are complete. To learn more about stroke rehab and recovery, check out the American Stroke Association’s website. Heart disease kills about 610,000 people in the United States each year — 1 in every 4 deaths — more than any other disease, according the Centers for Disease Control and Prevention. It’s commonly known that exercise and eating a healthful diet are keys to keeping your heart in tip top shape. But there are seemingly unrelated conditions and lifestyle habits that can lead to heart disease. Here are five lesser-known causes of heart disease that you can do something about: Sleep apnea; stress, anxiety and loneliness; sitting all day, influenza and dental disease. “Sleep apnea is very common, especially as we get older, and it puts enormous stress on the heart,” says Dr. Andrew Freeman, director of cardiovascular prevention and wellness at National Jewish Health in Denver. People who have sleep apnea tend to also have other conditions that are associated with the disease, such as high blood pressure, atrial fibrillation (a kind of irregular heartbeat) or pulmonary hypertension, which Freeman defines as high blood pressure on the right side of the heart. Symptoms of sleep apnea include daytime sleepiness, memory problems and irritability. Being overweight or obese and even structural features, such as having a big chin or tongue, may also make you more likely to develop sleep apnea, according to the American Lung Association. Premenopausal women are less likely to have sleep apnea than men, but postmenopausal women and men of any age share similar risks. After reaching adulthood, sleep apnea becomes more common with age until you reach 60, when the chances of developing it begin to taper off. One way to treat sleep apnea is to use a continuous positive airway pressure (CPAP) machine at night. However, Dr. Mark Peterman, a cardiologist at Texas Health in Plano, says that many people find the machine uncomfortable to use. Other treatment options, depending on the severity of the problem, include weight loss, oral appliances (similar to a mouth guard), nasal decongestants and surgery. Stress can have powerful effects on the body that wreak havoc on your health. Some stresses, such as learning a new language or skill, can be positive. But Freeman says the majority of stress people experience, like worrying about children or finances, tend to have negative effects on the body. While it might be difficult to see the connection, the lack of social interaction and fulfilling relationships also impacts heart health. The American Heart Association says that, while stress can harm the heart, researchers still haven’t quite figured out the role stress plays in causing heart disease. Even for those who manage stress well, keeping up with life in our increasingly fast-paced world can still take its toll. “Treating stress with medication can be difficult, so it usually requires counseling and lifestyle changes,” Peterman says. We hear a lot about how important exercise is to keep your body and mind in shape. Studies also show that sitting the majority of the day increases your chance of developing heart disease. In a 2014 study of how a sedentary lifestyle affects blood pressure, researchers found a strong association between a sedentary lifestyle and an increase in blood pressure. This finding was independent of time spent in moderate to vigorous exercise. A 2015 study came up with similar findings: Sitting down the majority of the day can increase your risk for heart disease, stroke and even diabetes — even if you exercise an hour a day. Luckily, this heart risk factor is easily remedied with increasing physical activity. If you’re having trouble getting started, Peterman suggests technological devices like Fitbits to help you become more aware of your daily movement and motivate you to exercise. If you think the only consequences of getting the flu are having body aches, a runny nose and fever for a week or two, think again. The flu can increase the risk for heart problems stemming from the inflammation it causes. Peterman says the flu has been linked to increased risk of heart trouble between the months of October and February. One study published in the 2016 found that people who had the flu were six times more likely to have a heart attack within the first seven days of their condition being confirmed with laboratory testing. Sounds like your doctor may have more than one reason for recommending you get a flu shot. Dental health is important for more reasons than a great smile; it can also work wonders for your heart. Mouth issues like cavities and gum disease can trigger chronic inflammation, which Peterman warns can speed up hardening of the arteries, or atherosclerosis, causing the risk of heart problems to soar. But not to worry. This problem is easily remedied by maintaining good brushing and flossing habits along with regular trips to the dentist. Eat a predominantly plant-based diet; limit your consumption of animal-based products. Get at least 30 minutes of brisk activity each day. Make time for a little stress relief each day. Prayer, yoga, meditation or anything else that helps you become more mindful and live in the moment helps. Build a strong social network so you feel connected, supported and loved. “Switching the body into an anti-inflammatory healing environment is what we’re trying to do to get people to heal,” Freeman says. Hopefully these extra tips will help you take a load off your heart — and your life. As if there weren’t enough things keeping you tossing and turning each night, here’s a new one: Using short-wave, blue light-emitting e-readers, like the iPad, iPhone, Nook Color, Kindle and Kindle Fire before bedtime can make it harder to fall asleep, according to a December 2014 study at Brigham and Women’s Hospital in Boston. Carry extra pounds, especially in the neck and trunk section, and it’s more likely you’ll suffer from sleep apnea, which causes your airway to become blocked or obstructed during sleep, robbing you of quality deep sleep. The condition affects 90 percent of obese men, though it’s not purely a man’s disease. The Cleveland Clinic reports that after menopause, it’s just as likely to affect women. Even more disturbing, it goes undiagnosed in as many as 80 percent of those who get a lousy night’s sleep. “Sleep apnea can mask itself as fatigue, trouble with concentration, dry mouth or even depression,” Breus states. Unfortunately, the relationship between sleep apnea and obesity is a bit of a chicken-egg scenario. Do sufferers have problems because they’re obese, or is their obesity stoked by their compromised sleep? No one knows for sure, but what is known is this: Poor sleep makes people less motivated to increase physical activity, which can lead to more weight gain. Additionally, reduced sleep is associated with elevated levels of the hormone leptin, which helps regulate appetite. Many popular over-the-counter pain medications, like Excedrin and Bayer Back and Body, may contain caffeine, which helps the medication get absorbed more quickly, but can cut into your sleep, according to Breus (who suggests always checking the label first). If you’re feeling under the weather, beware of nasal decongestants and daytime cold or flu medicines, as well, which can contain pseudoephedrine; you’ll feel jittery instead of tired. Diuretics, water pills for heart disease and high blood pressure, and ADD medications like Adderall and Ritalin can also disrupt sleep, says Dr. Hrayr Attarian, a neurologist at Northwestern Memorial Hospital in Chicago, Ill. Other culprits include steroids and some medications for depression or asthma. “As with any new medication, always check with your doctor first,” Attarian says. Body temperature naturally begins to drop before bedtime, preparing us for sleep. Although a warm bath can relax and calm you, taking one too close to bedtime will not give your body enough of a chance to cool sufficiently to bring on slumber. If you like to snack before bed, watch what you eat. Loading up on foods that contain excessive salt or fat can stimulate brain waves, bringing on nightmares instead of sweet dreams, says the National Sleep Foundation. Choose foods that contain tryptophan (an amino acid linked to sleep quality), whole-grain carbs (which help boost serotonin production) and certain minerals (like calcium and magnesium, which can have a calming effect). Examples include half a banana and a handful of almonds, whole-grain crackers and peanut butter, a mug of warm milk, or half a turkey sandwich on whole-wheat bread. The ideal bedroom should be simply furnished and decorated, so there’s not much to distract you from the primary reason you’re in there — to sleep. Excess clutter and mess can often cause anxiety, and remind you of all your unfinished business, making it harder to fall — and remain — asleep. Sure, being physically active can make you tired, promote sleep and improve the quality of your rest, but exercising vigorously too close to bedtime can rev you up instead. “Aerobic exercise can raise your core body temperature long after you’ve finished,” says sleep specialist Rubin Naiman. If meditation is not your thing, there’s always a good old-fashioned belly laugh; laughter actually induces physical changes in your body, says the Mayo Clinic. It cools your stress response and can increase positive thoughts, which, in turn, causes your body to release neuropeptides to help fight stress. Not long ago, when I interviewed one of the leading experts on “sitting disease” — the buzzy catch phrase that’s been attached to physical inactivity for the past few years — he walked in place on his treadmill desk while we chatted by phone. The irony wasn’t lost on me: I was sitting idly at my desk while writing an article about the health problems associated with sitting idly at desks. Meanwhile, the expert in the know was staying active, even though he had a desk job. I recently added a treadmill desk to my office, which I fashioned myself out of a regular treadmill and some supplies from the hardware store. It’s empowering to work while walking at 1.6 miles per hour, knowing that I’m taking care of my health. Unless you make an effort to get moving, it can be easy to fall into a physically inactive lifestyle. You can accomplish some of the same tasks from a seated position today that required walking just a few years ago: Think online shopping and drive-through everything. And with the widespread popularity of screen time, you’re likely allured into a seated position by your smartphone, laptop or TV for several hours daily. Between your desk job, commute, meals and nightly leisure time on the couch, you probably sit for the bulk of your day. Unfortunately, an inactive lifestyle can be detrimental to your health. Prolonged sitting is linked to a host of health problems, including heart disease, diabetes, obesity, high blood pressure and cancer. Luckily, research shows that there are simple ways to combat chronic physical inactivity, but it requires consistent effort; your morning walk won’t help to counteract the effects of a full day of sitting. Finding ways to add more movement all day long is key. “Moving more frequently throughout the day, even at lower intensities and for shorter duration, has a positive impact on health markers and is just as important as regular exercise,” says Lauren Shroyer, director of product development for the American Council on Exercise. Think about your daily schedule, then figure out ways to be more active. The last time that I spoke with Levine — who is also the former director of obesity solutions for the Mayo Clinic — he was walking on his treadmill desk. Now he says that people can inspire themselves to be more active by mapping out a weekly plan, scheduling one appealing activity each day: Window-shopping downtown, volunteering at the library, wandering the aisles at Walmart or spending the afternoon with grandkids. The problem with sitting is that once you park yourself at your desk or on the couch, you’re likely to stay seated for hours. But regularly shifting from sitting to standing helps to improve your health and preserve your long-term mobility. For this reason, Vernikos advocates standing often, whether you place your water bottle just out of reach to encourage movement or train yourself to get up when commercials come on TV. Her research found that standing for one to two minutes every 20 to 30 minutes helps prevent deterioration caused by physical inactivity. “Your body needs this on-off stimulation of changing posture,” Vernikos says. Standing from a seated position seems like the simplest of skills, but as people get older, the inability to do this prevents some from being able to use the bathroom independently, which makes them more likely to end up in a nursing home or assisted-living facility, Vernikos says. There are ways to counteract the inclination to stay seated all day. If you’re retired, you don’t have to sit at home all day, even when you have no plans. “Pacing the room while on the phone, using your standing work station or putting your laptop on the kitchen counter for 15 minutes are additional ways to work in more muscle activity throughout the day,” Shroyer says. Just because there are modern conveniences doesn’t mean you have to use them constantly. Try doing activities the way you would have done them decades ago: Walk into your co-worker’s office to share an idea instead of emailing him. Visit the teller at the bank instead of frequenting the drive-through. Order something online, then pick it up at the store instead of having it shipped to you. Renowned neurosurgeon Dr. Keith Black (chair of the department of neurosurgery and director of the Maxine Dunitz Neurosurgical Institute at Cedars-Sinai Medical Center in Los Angeles) has pioneered advances in our understanding and treatment of brain cancers and complex neurological conditions. Black is also a research scientist studying targeted drug delivery, cancer stem cells and Alzheimer’s detection through retinal imaging, among many other areas. In an interview with the Milken Institute Center for the Future of Aging, Black talks about the importance of developing a test for early onset Alzheimer’s and his goal to inspire the next generation. What is the most important thing that people should know about improving brain health? People need to know how important lifestyle is to sustain health. Lifestyle, diet, exercise, moderating stress, making sure you get a good eight hours of sleep when you can, making sure you keep your brain engaged particularly in novel activities — all of these matter. You have to remember the brain is a living organism very much like a muscle — the more you use it, the stronger it becomes. We need to treat our brains better. For example, try to avoid excessive alcohol and make sure that you screen yourself for diseases like diabetes and hypertension that can be devastating to the brain. What will be the benefits of having a reliable test for early onset Alzheimer’s? I think there’s a huge misconception that if you get Alzheimer’s or if you’re going to get Alzheimer’s, there’s nothing that you can do about it. And I think the science shows that that perception is incorrect. We know two things now that address your question. The first is that Alzheimer’s starts about two decades before a person develops symptoms. During that period of 20 years, you’re losing brain cells, and you’re losing brain connectivity. If you can detect the disease at the very start, particularly before you lose enough brain cells to become symptomatic, we may have the ability to stop the process or at least slow it down and prevent an individual from becoming symptomatic. If people are developing Alzheimer’s in their 50s and 60s, they are going to become symptomatic in their 70s and 80s. If you can slow the overall process and have people become symptomatic in their late 90s or 100s, you have the ability to essentially prevent the disease from being symptomatic in most of our lifetimes. That’s really the major reason to move towards early detection, because preventing brain loss is a lot easier than restoring brain cells once they’ve died. The other reason people should be interested is that even though we don’t have a pill that can stop the progression, we know that Alzheimer’s also has a lifestyle component. The scientific evidence shows that lifestyle habits such as a Mediterranean diet, exercise, sleep, meditation and other types of mindfulness modify stress levels. We’re seeing that potentially even micronutrients like the omega-3 fish oils may be very important in slowing the progression of Alzheimer’s disease. What’s your take on Pfizer ending research to find new drugs aimed at treating Alzheimer’s and Parkinson’s diseases? How do you think it will impact ongoing research? I think a lot of the trials that have failed for Alzheimer’s disease, including the Pfizer trial, could’ve been better designed and better developed. I think we have a lot to learn from the failure of those trials. For example, how do we get the drugs into the brain more effectively? How can we better select the right population of patients to treat? I think addressing those potential reasons for the failures of those drugs will lead to successful therapies and hopefully successful approvals. Christina Soriano, associate professor of dance and director of the dance program at Wake Forest University in Winston-Salem, N.C., as well as associate provost of the arts for the school, is a 2018 Influencer in Aging and the founder of IMPROVment ®, a program focused on physical and mental fitness for those with neurodegenerative diseases. Since 2012, Soriano has led free weekly community dance classes in Winston-Salem for people living with Parkinson’s disease (PD) and Alzheimer’s disease. Next Avenue: How did you first become interested in improvisational dance for those living with neurogenerative diseases? Christina Soriano: My mentor, Glenna Batson, who is the emeritus professor of physical therapy at Winston-Salem State University, is a physical therapist, dancer and leading practitioner in the field of dance and movement. She knows how the benefits of dance and movement can benefit wellness. In 2012, she invited me to be part of a study she was doing about balance. I had no previous scientific experience — I trained as a performer and choreographer. But I had always admired her work, and the opportunity came at a point where I was ready for a new way to fall in love with my art. I have also admired the work of David Leventhal of the Mark Morris Dance Group in New York City; he’s the director of the Dance for PD® which started as a collaboration between the Mark Morris Dance Group and the Brooklyn Parkinson Group. They created a program that is now international; dance is recognized as an effective tool for people living with Parkinson’s. In the IMPROVment classes, what are the strategies used that make it comfortable and enjoyable for the participants? The classes are based on a series of auditory prompts or cues. The improvisational nature of the experience gives everyone the opportunity to create exercise while honoring where they are physically. They can be more confident in their movements. They aren’t being asked to learn something. There are no ‘wrong’ movement choices. There is no judgment. An important clarification to make is that this is not dance therapy. I am not a trained dance therapist, and there is also a danger in thinking that this type of movement is only for a prescribed period of time, as therapy would be. We call this a practice — taking a movement class becomes not only part of your day, but part of your life. I really observe a different type of physical confidence that happens after class ends. The strides and gait lengths of the participants may be increased. I also believe the social benefits, as much as the physical ones, are huge. And there is laughter. They leave a little bit renewed — I know I do, too. Another benefit of these classes is that the caregivers participate. The pair shares a movement experience that is joyful in so many ways. The idea of who has PD and who doesn’t have it goes away. How do you believe that an art form, like dance, can impact aging? In May, we hosted the Aging Re-Imagined Symposium 2.0 at Wake Forest; the first one was held in 2016. The event came about because I started working with scientists, like Christina, and as the artist in the room in our meetings, I realized there is so much that artists and scientists can learn from each other. Aging Re-Imagined features speakers and presentations that look at aging from so many different perspectives. The event is open to the community, as well as faculty members and researchers. It is our goal to allow those in the fields of arts and of science to meet to dialogue together. In my case, my lab is a dance studio. Where do you find the most joy in working with dancers who have PD (or other neurodegenerative diseases)? What have you learned? An incredible community has been created. The class has become like a family. We celebrate birthdays and anniversaries. Some of my dance students from Wake Forest lead classes at an adult day center in Winston-Salem with individuals who are far along in their dementia journey. I really believe that it’s important for the younger and older generations to be part of a creative process together. Shy of becoming a parent, this has been the most meaningful experience of my life. It all began with an invitation to do something I didn’t know anything about, but I want to continue doing this work, bringing it out there to others. Dance is a deep reflection of our lives. What we practice in the studio is part of humanity. Julie has worked as a writer and editor for more than 20 years; most recently she was a managing editor for the community lifestyle magazine group at Tiger Oak Media in Minneapolis, where she also served as editor of Saint Paul Magazine. Julie can be reached via email at jpfitzinger@nextavenue.org Follow her on Twitter @juliepfitzinger. On a typical morning, you’re likely to find Chris Kelly, 64, at his neighborhood YMCA in Downers Grove, Ill. The retired captain for United Airlines starts his day with an early workout. “I’ve always enjoyed physical activity,” says Kelly. “I wasn’t a natural athlete but I gravitated toward things like running and lifting weights… and I played hockey for about 20 years.” While his hockey days are behind him, he stays fit with a mix of cardio and lifting weights. Kelly doesn’t have to make himself go to the gym; it’s simply part of his lifestyle. And anyone over 50 can make the transition from sporadic workouts to a more committed routine. The key to becoming a lifelong exerciser has less to do with access to a gym or even having perfect health and more to do with other factors that you can control. That means scheduling it like you would any other activity. And while working out in the morning increases your chance of sticking with it, choose a time that works for you. Some people prefer midday workouts, while others opt for late-afternoon sessions. Research shows that having a workout buddy makes you more likely to stick with an exercise program. “If you have a spouse or significant other, that person has to be supportive and realize that it’s a priority for you,” says Wadsworth. “Is your partner willing to allow for funds to be spent on a gym membership or for equipment, for example?” Talk to your significant other about your intentions and get him or her on board. Or enlist a friend to work out with you. Kelly has belonged to the same YMCA for 25 years and has made longstanding friends there. “When I was younger, I did a lot more by myself, but the social part of it has become a much larger part of what I enjoy,” he says. It may sound counterintuitive, but pushing yourself a little harder than normal can increase the pleasure you derive from exercise. A recent study published in PLoS One found that upping the ante — doing a more challenging workout that includes intervals as opposed to steady-state cardio — can increase the amount of enjoyment you get from your workout. And when you feel good post-workout, you’re more likely to want to keep doing it. Hate working out in a gym? Then don’t do it! Maybe standup paddle boarding or a barre class will be a better fit. Another non-negotiable? A couple days of strength training every week. “For women especially, I always encourage strength training,” says Wadsworth. That will allow you to continue to do the everyday tasks you may now take for granted. People who exercise for extrinsic reasons — like to lose weight or to look a certain way — aren’t as likely to stick with it as those who have intrinsic motivation, which is doing exercise for its own sake. Being mindful about your workouts — paying attention to the feeling of moving your body and the satisfaction you feel at the end of workout — can help develop this inner motivation. Kelly said exercise will continue to be part of his retirement. “When I leave the Y after my workout, I feel great. There’s no other way to put it. So why would anybody stop doing things that make you feel good?” he asks. Lori Mittereder, lifestyle engagement team leader at Westminster Place, the personal care community at our Oakmont campus, has a special bond with John Eisenmen, or “Coach John,” as she likes to call him. 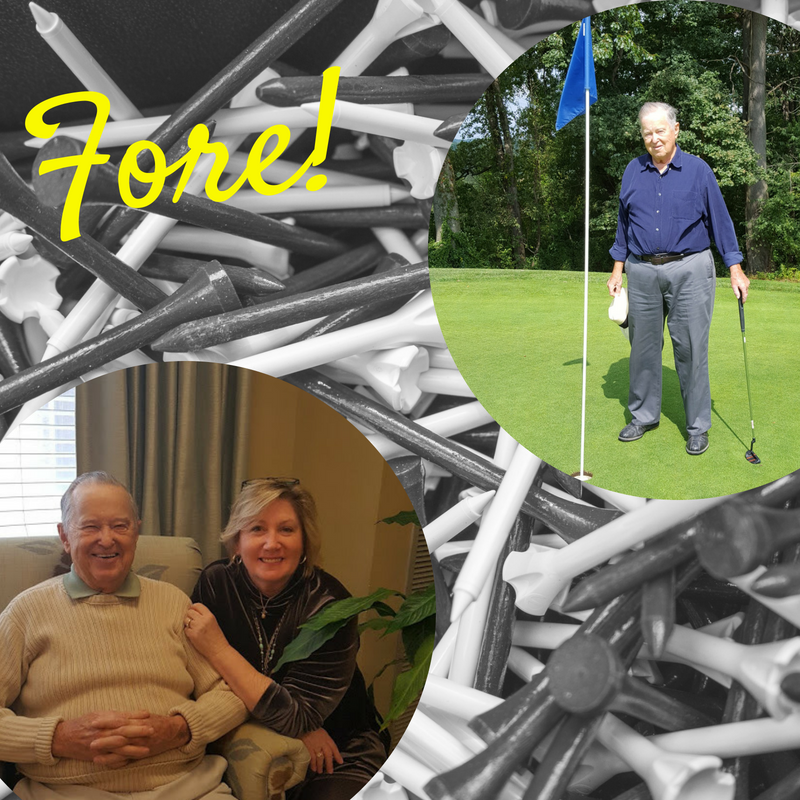 John has lived at Westminster Place for three years and when he moved in, he brought his clubs with him. Lori noticed this, and knowing a little about golf herself, thought it may be a good time to learn more about the game and learn a little more about John. She found out that John, who is 90-years old, has been golfing at local courses for over 25 years. After talking with John, Lori wanted to hit the course and get back in the golf game. She asked John if he would join her, he agreed, making them instant golf buddies. This past summer, the duo played golf at least two times a week. When John is not golfing, he enjoys tending to the community garden in the Courtyard at Westminster Place. This story is a perfect example of our person-centered culture. By taking just a few moments to get to know each other, Lori and John have started to create a lifetime of memories.